Autumn is here so it’s time to harvest your apples. Fresh, crisp and delicious straight from the tree, here’s tips on timing when to pick and how to store your apples. Like all fruits, different apple varieties ripen at different rates within a season. Early apples arriving in late February such as the Early Strawberry variety are best eaten as soon as they are picked. Later varieties picked in April are suitable for storing. Take a look at an apple before picking. Check for its ‘ripe’ colour along with the its ‘undercolour’ which generally progresses from dark green, to light green to shades of yellow. When an apple’s colour looks good cup the apple and lift it up. If it’s ready, it will naturally come away. Cut the apple in half to check the seeds are dark brown. After cutting, the apple flesh should stay white. If it’s not ready the apple will oxidise and go brown. Taste the apple – you’ll soon know if it’s ripe! Apples on a tree ripen at different stages. If the foliage on the tree is dense the apples on the inside will take longer to ripen. So start picking from the outside and work in. It can take another two weeks before the inside apples are ready. 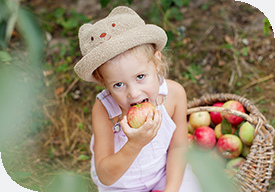 Don’t wait until apples have dropped onto the ground as, for some varieties, this means they are past their best. During an apple trees first two years remove the fruit so the trees energy goes into growing its roots and branches. In year three the tree should produce a small crop and by years five and six the tree will be at full production. For storage Kath Irvine recommends storing apples in a fridge at 4°C in plastic bags with lots of holes pricked in them. She has achieved six months storage using this method. Kath Irvine is a permaculture designer and has been designing and managing edible gardens since the late 1990's. Passionate about growing food and good design, Kath runs workshops from her Edible Backyard. Go to http://www.ediblebackyard.co.nz/ for more info.